A classic of American government, Who's Running America? continues to demonstrate how power is concentrated in large institutions no matter who inhabits the White House. The eighth edition of this best-selling text focuses on the Obama administration and the ways in which it is different from but also similar to administrations that have come before. Based on years of exhaustive data compilation and analysis, Who's Running America? explores the influence and impact of governmental leaders, corporate officials, and other elites both inside and outside the United States. Employing an oligarchic model of national policymaking, Tom Dye doesn't just lay out theory and data. He very consciously "names names" in describing the people who inhabit the White House, the Cabinet, the leaders of Congress, members of the Supreme Court, as well as the board rooms of the nation's largest corporations and banks including leading media lights as well as "fat cat" political contributors. Dye argues that big institutions run America, but also that these institutions are made up of real people. Who's Running America? 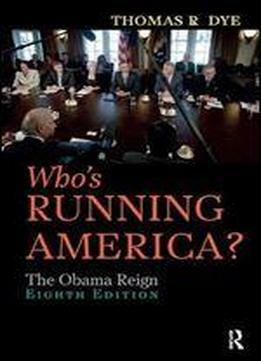 puts the flesh and bones on the statistics and delivers the inside scoop on the Obama reign.